There’s a good chance that Vikings linebacker Anthony Barr and wide receiver Stefon Diggs will hit the open market in 2019 if they don’t sign contract extensions, Joel Corry of CBSSports.com (on Twitter) opines. Corry estimates that the linebacker and wide receiver franchise tags will be $16.325MM and $17MM, respectively, and that may be too pricey for Minnesota’s liking. On Wednesday, we evaluated Barr as an extension candidate. Kirk Cousins‘ open-minded approach to the franchise tag should serve as inspiration to this year’s franchise tagged players, Albert Breer of The MMQB argues. That includes Rams safety Lamarcus Joyner, who is set to make $11.287MM this year and would call for a $13.544MM salary if tagged again next year. By standing pat, Joyner would receive either $11.287MM this year and a trip to free agency in March, or nearly $25MM across two seasons before hitting the open market in 2020. That could give Joyner the confidence he needs to stand his ground in extension talks, though this year’s disappointing free agent market for safeties could also steer him towards taking a deal. Eagles running back Matt Jones knows that he needs to get it together if he wants to stick in the NFL. “It could be [my last chance],” Jones said (via Tom Moore of The Morning Call). “That don’t scare me at all. I got my eyes on the prize. I’m here and I’m ready to work.” Jones inked a two-year, $1.5MM deal with the Eagles this offseason, but the contract contains zero guarantees. The majority of the 2018 NFL Draft class is now signed, but that’s not the case in Los Angeles. The Rams have yet to sign a single pick. Should fans be concerned? To put it simply, no. This isn’t new to the team, as Michael David Smith of PFT writes, as it likes to address financial planning with its players before giving them a large signing bonus. Like in years past, the Rams rookies will all generally sign at once sometime in the next few weeks. So no need to panic Rams fans. This is par for the course. 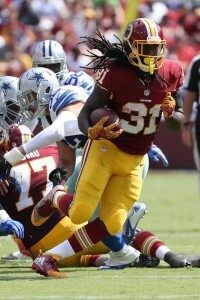 The Eagles signed running back Matt Jones earlier in the week. The Philly Voice’s Jimmy Kempski has the details at two years for $1.5MM, none of which are guaranteed (Twitter link). He joins a crowded backfield that includes Jay Ajayi, Corey Clement and Darren Sproles. The Colts have had visits from Kenny Vaccaro, Tre Boston and Bashaud Breeland in recent days. Stephen Holder of the Indianapolis Star tweets, however, the meetings were merely informational and no signings are imminent. And we’ll also make pitstop in the CFL, where Johnny Manziel is not guaranteed to start for the Hamilton Tiger-Cats, Pro Football Talk’s Michael David Smith writes. Smith quotes head coach June Jones, who praised current starter and former Oregon standout Jeremiah Masoli. “Let me tell you something right now, he’s got his work ahead of him to beat out Jeremiah,” Jones said of Manziel. “He’s got a lot to catch up on, but he’ll spend the time to get that done. I know he will because he’s already learned that lesson.” Though Masoli has the leg up, it won’t be long before Manziel is given the reins, given he can stay out of trouble. The Eagles will sign free agent running back Matt Jones, Ian Rapoport of NFL.com tweets. Jones worked out alongside two other running backs on Tuesday and won the competition. The Eagles have confirmed the news while disclosing that it is a two-year deal. 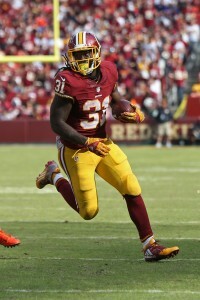 Jones, a former third-round pick of the Redskins, was Washington’s lead rusher for a time and showed promise in short bursts. However, he slipped down the depth chart over time and was jettisoned from the roster last year. The 25-year-old moved between the Colts’ active roster and practice squad last year but averaged less than three yards per carry in his limited time with the varsity squad. Jones will now fight to make the cut with the defending champs. The Eagles will head into the season with Jay Ajayi as their primary ball carrier while Corey Clement, Darren Sproles, Wendell Smallwood, D.J. Pumphrey, and Jones vie for supporting roles. Before signing Jones, the Eagles also auditioned former Ravens running back Terrance West. The Colts announced that they have waived running back Matt Jones. Linebackers Darnell Sankey and Jermaine Grace, wide receiver Justice Liggins, nose tackle Joey Mbu, and defensive end Arthur Miley were also waived while defensive tackle Johnathan Calvin was waived-injured. Jones was once primed to be the Redskins’ primary running back, but he slipped down the team’s depth chart over time. 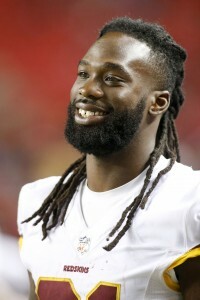 The Redskins waived Jones after they were unable find a trade partner for him, leading him to the Colts. He cycled between the Colts’ active roster and practice squad throughout last year, but the team has decided against keeping him on the expanded roster now that the draft has concluded. The Colts selected NC State’s Nyheim Hines in the fourth round and Mississippi’s Jordan Wilkins in the fifth round, so there was little hope for Jones to make the final cut. Marlon Mack and Robert Turbin project to be the Colts’ lead rushers while Christine Michael and Josh Ferguson will battle alongside the two rookies for a place on the roster. Jones, a 6’2″, 239-pound athlete, has played in 25 career games with seven starts. All in all, he has averaged 3.9 yards per carry with six rushing touchdowns. Sankey appeared in six games for the Colts last year and spent time on the team’s practice squad. He wrapped up the year on the Ravens’ taxi squad, but circled back to the Colts for a futures deal in January. Matt Jones is back on the waiver wire. The Colts parted ways with the third-year running back on Saturday, ending a two-plus-month stay on their 53-man roster. Indianapolis cut Jones to make room for wide receiver K.J. Brent, Adam Caplan of ESPN.com reports (on Twitter). The Colts waived Jones in early September, only to bring him back via practice squad invitation. That could again be the move the franchise has planned, but the former Redskins starter is now unattached. The Redskins cut Jones after the preseason concluded, and the Colts claimed him on waivers. He played in just three games this season and recorded five carries for 14 yards. The Colts have Frank Gore, Marlon Mack and Josh Ferguson as their active-roster running backs. Jones averaged 4.6 yards per carry in 2016, but the Redskins benched him primarily because of fumbling problems. He’s yet to re-emerge as a coveted ball-carrier. Matt Jones is back on with the varsity team. The Colts have elevated Jones from the practice squad, as Adam Schefter of ESPN.com tweets. To make room, guard Ian Silberman has been waived. Jones was once primed to be the main ball carrier in Washington, but the Redskins informed him this offseason that he would not be a real part of their plans. He pushed for a trade out of D.C. for months, but a deal never materialized. Finally, on Sept. 2, the Redskins waived him, allowing the Colts to add him to the roster. He was dropped just prior to the season opener, but was quickly re-signed to the practice squad. Now, he’s back on the 53-man roster in advance of Sunday’s game against the Browns. There’s no word yet on whether Jones will be on the active game day roster this week. But with Marlon Mack nursing an injured shoulder and Christine Michael on IR, he’s a good bet to dress. He’s expected to slot behind Frank Gore and Robert Turbin. Despite being cut after less than a week with the Colts, Matt Jones will stay in Indianapolis. The former Redskins starter agreed to sign with the Colts’ practice squad, Mike Garafolo of NFL.com tweets. This move would not have been possible as recently as a few years ago, with Jones having played in 20 regular-season games. But practice squad eligibility has expanded, via the practice squad exception rule for which Jones qualifies as a player with fewer than three accrued NFL seasons, leaving the Colts the option to attempt to develop Jones on their taxi squad. The Redskins cut Jones last week after having benched him midway through last season. The former third-round pick, though, averaged 4.6 yards per carry in 99 attempts last season. Indianapolis houses three running backs on its active roster, with Robert Turbin and rookie Marlon Mack stationed behind Frank Gore on the depth chart. With the Colts not previously employing a running back on their practice squad, Jones now becomes the team’s No. 4 back. The Colts cut outside linebacker Garrett Sickels from their practice squad, Mike Chappell of IndySportsCentral.com tweets. Matt Jones‘ tenure with the Colts has already come to an end. Less than a week after claiming him from the Redskins, Indy announced this morning that they’ve waived the running back. The team has promoted guard Adam Redmond from the practice squad to take the open roster spot. Jones was waived by Washington last week, and he was subsequently claimed by the Colts. 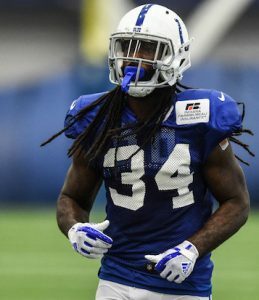 The fit made sense for Indianapolis; the team was relying on a 34-year-old starting running back in Frank Gore, and backups Robert Turbin and Marlon Mack aren’t the most intriguing options. However, it appears as if the team is content heading into the regular season with the trip of running backs. Jones had shown promise with the Redskins, rushing for 490 yards and compiling 304 receiving yards in 2015. However, he took a step back in 2016, compiling 460 rushing yards in seven games. By the end of the season, he was behind Robert Kelley and Chris Thompson on the depth chart. While he owns a modest 3.9-yards-per-carry mark during his career, Jones has had issues taking care of the ball, compiling eight fumbles in two seasons. As Ian Rapoport tweets, the Bears attempted to claim Jones last week, so they might bite on the 24-year-old. Redmond, a 2016 undrafted free agent out of Harvard, spent most of last season on the Colts practice squad. Mike Chappell of IndySportsCentral.com tweets that Joe Haeg and Le’Raven Clark are currently the team’s only healthy lineman, and Redmond will provide the squad with some extra depth. In fact, Chappell believes Jones could be back with the organization once the rest of the line is healthy (assuming he clears waivers).